'Bold Excess' (Caroline Chacon, R. 2010). Seedling AZ.11I. AB(OGB), 22"-24" (56-61 cm), Early bloom. 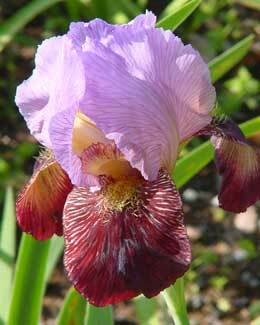 Standards and style arms rose violet; Falls same, overlaid dark maroon-violet on most of petal, dark maroon violet signal; beards rose violet. FIPN ('Final Inning' x 'Pro News') X Norris N88D1: (tet. aril x 'Earl Of Essex').